Today is Sea Sunday - 2nd Collection: when the Church prays for all those who live & work at sea. Without them we would not have most of the items we buy in the shops. Today’s second collection is for the Apostleship of the Sea (AoS), the Church’s official maritime welfare agency. It supports seafarers both practically & spiritually. This annual collection is absolutely vital to enable it to continue to work, so please give generously and remember seafarers in your prayers. Thanksgiving Mass & Party today: Every time Mass is offered; (the very word ‘Eucharist’ means thanksgiving) we thank Almighty God. We give thanks for our life, our loved ones, our blessings and most of all for the Good News of salvation. Today we thank God for our First Communion Children and for the beautiful way all the ceremonies went, including a wonderful Corpus Christi procession & Confirmation. Dear parents, the ball is in your hands. Don’t neglect to nourish and nurture your child’s piety. Otherwise it can all die and they grow up without the treasure of a living faith. Pray for our families to be strong. Welcome to Gabriel Leichnig: a French Seminarian from the traditional “Institute du Bon Pasteur”. He was born on the Island of Reunion which is next to Mauritius and has finished his philosophy at their seminary south of Chartres. He was walking alongside some of you on that famous pilgrimage and is here for 3 weeks exposure to parish life. Next year he will do a pastoral year in Brazil where the Institute have many vocations. Welcome back to Fr Andrew Southwell & Fr Gabriel Diaz on Tuesday. Do you have any photos of the Corpus Christi Procession? Please send them to our email address stbedecp@gmail.com . Thank you. Fr Przemek - Next Week: will preach at every Mass. Then at around 1pm we will have a presentation followed by a shared lunch. Welcome and bring some food! Welcome to God's Church: Isobelle Winter Utton-Gaant, daughter of Theo & Marie-Claire; Oliver Durban-Otukwu, son of Chinedu & Jaqueline and Joseph Rafel Markus Gerard Portelli, son of Benjamin & Jutta who were all baptised in June. Cleaners this week: Tricia & Emma Johnson, Teresa Ablett & Franca Otuo. 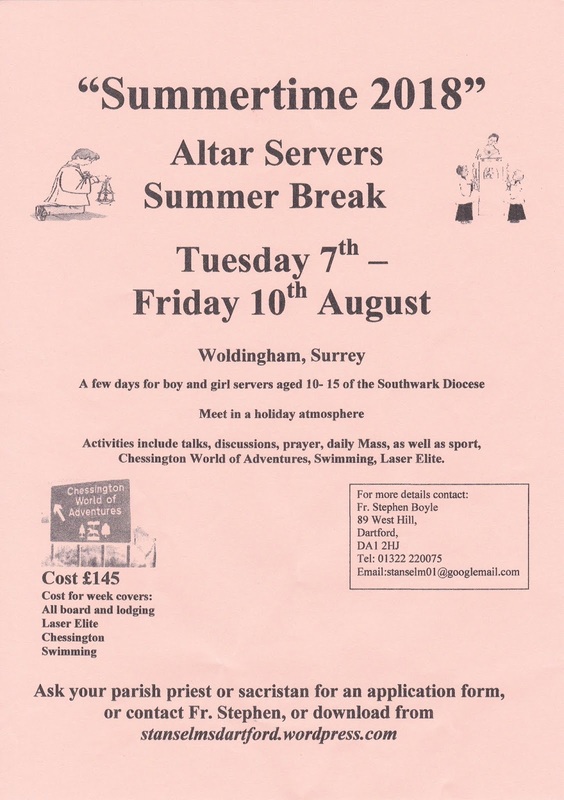 The new rotas have now been sent in the post, if you haven’t received yours, spare copies are at the back of the Church. Do you have any old glasses lying around at home? Paula Tolhurst will be leaving a donation box in the church porch where you can leave them. Once the box is full, she will send them off with a charity to India. 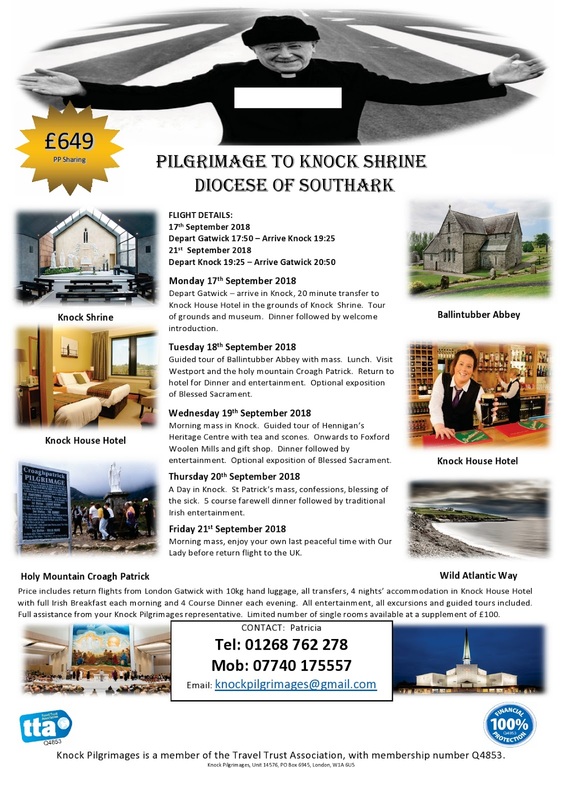 Knock Pilgrimage: £649 pp sharing. Price includes flights (with 10kg hand luggage); transfers, 4 nights’ with full Irish Breakfast & 4 Course dinner. All excursions & guided tours included. Wheelchair accessible rooms in the hotel. Limited single rooms (supplement £100). 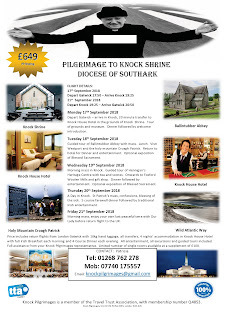 Contact Patricia 01268 762278 or 07740 175557 or email knockpilgrimages@gmail.com. Knock Pilgrimages is a member of the Travel Trust Association and is fully protected by ATOL T7613. St John's Seminary - Wonersh: The Seminary, near Guildford, Surrey (which has been involved in the formation of priests for England and Wales for over 125 years) is looking for some help with the cost of redecoration and refurbishment of 30 of its bedrooms, which have received little or no upgrading for 40+ years. Many rooms have threadbare carpets and curtains which are close to disintegration. Some of the beds, mattresses and other furniture began their life in the Junior Seminary at Mark Cross, Sussex - which closed in 1970. 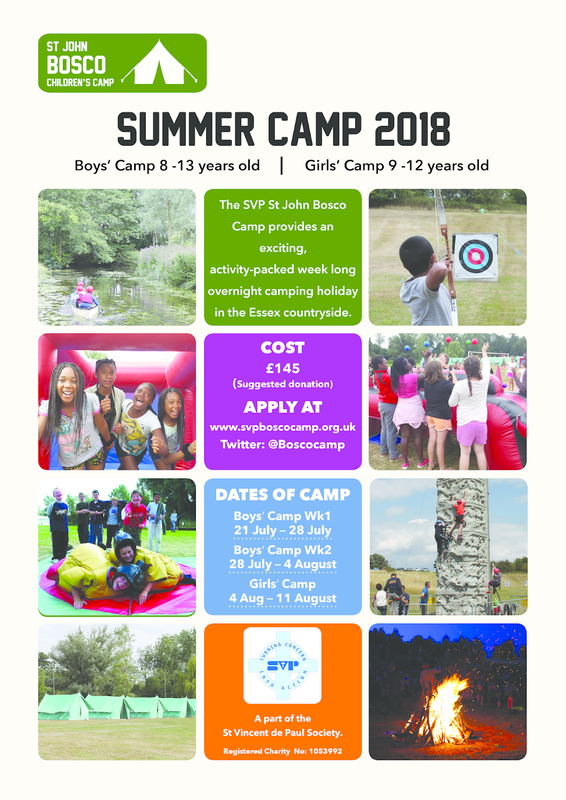 St John Bosco Children’s Summer Camp at Aldham Essex. 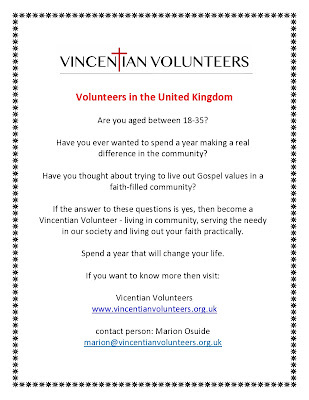 For children aged 8-13 yrs and costs £145 p/wk. 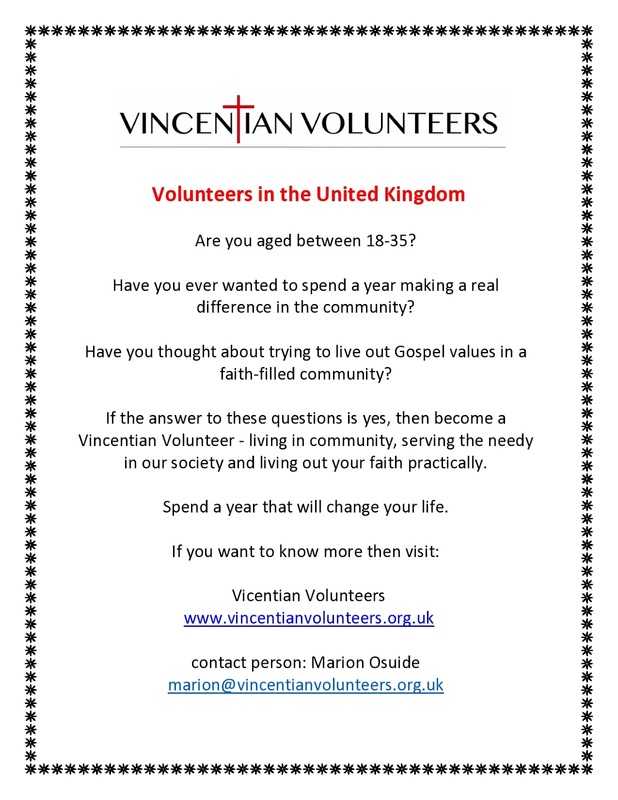 For more info & to get the application forms, please visit www.svpboscocamp.org.uk. Enquires: boys camp boysbookings@boscocamp.co.uk / girls camp girlsbookings@boscocamp.co.uk.